Beach Walk East is a luxury waterfront condominium building providing resort-style services to residents in Highland Beach, Florida. 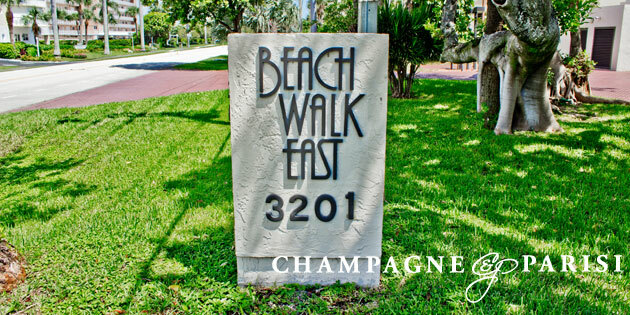 Residents escape to paradise while living in any of the 43 elegant condos that comprise Beach Walk East. The luxury building is burrowed between the Intracoastal and the Atlantic Ocean giving residents breathtaking views of the water. When you arrive at Beach Walk East’s stunning lobby, private elevators take residents up to their updated interiors that include marble foyer entryways, French doors, custom built-ins, chef’s kitchens with islands, stainless steel appliances, granite countertops, and wood cabinets, oversized pantries, walk-in closets, wet bars, libraries, spacious master suites, steam showers, and wrap around covered balconies. The units at Beach Walk East range from 1,800 to 3,000 square feet, and all have access to great amenities. These amenities include a gorgeous pool, hot tub, private beach with comfortable chairs, immaculate fitness center, steaming sauna, community room for entertaining, game room, and library. Beach Walk East Condo building also comes with a doorman, security system with cameras, and underground parking.